Native Tethering Brought to the iPhone 4 by TetherMe. TetherMe is a new Jailbreaking app which brings Native Threating to the iPhone 4. As said on the description of the app, it should work with any carrier without the need of customized bundles or preferences. Some may mistaken it with the jailbreak app MyWi which allows to turn your iPhone into a wifi hotspot but this is not the same and instead it allows for native tethering as Apple intended it to be, using Bluetooth or USB. There’s no icon for the app and is enabled after installing and rebooting the iPhone, you’ll be able to turn tethering ON in Settings > General > Network, or install the Tethering Toggle for SBSettings. The app is a good alternative to MyWi if you don’t want to share your Internet connection with other devices but if your main purpose is to use your iPhone as a WiFi spot than MyWi is best. 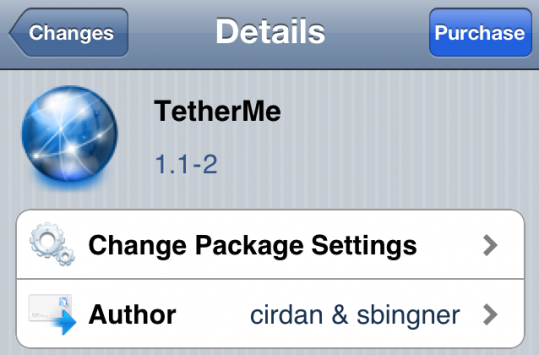 The TetherMe app is available for 1.99$ on Cydia.